Chewy Hughie chews anything and everything he can get his paws on, driving his owners to distraction! 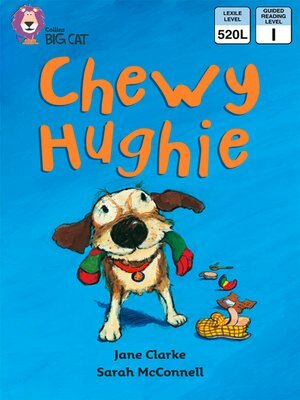 But what happens when Chewy Hughie discovers a packet of bubblegumâ?¦ This is a lively rhyming story by Jane Clarke, illustrated with stunning artwork from Sarah McConnell. Chewy Hughie chews anything and everything he can get his paws on, driving his owners to distraction! But what happens when Chewy Hughie discovers a packet of bubblegumâ?¦ This is a lively rhyming story by Jane Clarke, illustrated with stunning artwork from Sarah McConnell. Pages 14-15 provide a storymap of the house, which consolidates understanding, and provides a wealth of speaking and listening opportunities. Turquoise/Band 7 books offer literary language and extended descriptions, with longer sentences and a wide range of unfamiliar terms.